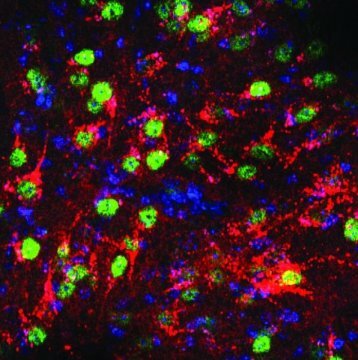 Being able to manipulate specific circuits can uncover surprising relationships between brain areas and provide great insight into how the sensory, emotional, and behavioral centers work together to drive reactions," said Jim Gnadt, Ph.D., program director at the NIH&apos;s National Institute of Neurological Disorders and Stroke (NINDS) and a team lead for the BRAIN Initiative. "The tools and technologies developed through the BRAIN Initiative have made studies such as this one possible." A team of researchers led by Andrew Huberman, Ph.D., professor of neurobiology and of ophthalmology at Stanford University in California, investigated the role of the ventral midline thalamus (vMT) in determining how animals respond to visual threats. The thalamus is a brain region that acts as a relay station, taking in sensory information, such as what is seen and heard, and sorting out where in the brain to send that information. Dr. Huberman and his colleagues showed that the vMT was activated when mice were confronted with a threat, specifically a black circle that grew larger on top of their cage, mimicking the experience of something looming over them. When faced with the looming threat, the mice spent most of the time freezing or hiding and very little time rattling their tails, which is typically an aggressive response. To further investigate the role of vMT, Dr. Huberman&apos;s team used state-of-the-art tools, including designer drugs that allowed specific circuits to be turned on and off. Although inactivating the vMT had no effect on freezing and hiding, it eliminated the tail rattling response. Turning on the vMT increased the number of tail shaking responses and caused the mice to move around more and spend less time hiding or freezing. Dr. Huberman&apos;s group also discovered that the vMT sends information primarily to two brain areas: the basolateral amygdala (BLA) and the medial prefrontal cortex (mPFC). These circuits turned out to be critical in determining how the mice reacted to a visual threat. Turning on the circuit that projected to the BLA caused more freezing responses, while activating the mPFC circuit increased tail shaking responses. "Dr. Huberman&apos;s work is opening a new area of vision research with the looming threat model, helping us understand how circuitry in the brain works from sensation to behavior," said Thomas Greenwell, Ph.D., program director at the NIH&apos;s National Eye Institute. Dr. Huberman and his team showed that activation of the vMT increased arousal, a state of heightened alertness. Mice preferred spending more time in a room where they received vMT activation, suggesting that turning on that brain circuit made them feel good. Although there may have been a difference in response to the visual threat, either tail shaking or freezing, the underlying positive feeling was the same for both types of reactions. "This study may help explain why acts of courage, such as standing up for yourself or for a cause, or a physical challenge can feel empowering. Experiencing that good feeling can also make it more likely to respond to future threats in a similar way," said Dr. Huberman. "Although our study was done in mice, learning more about the vMT may provide some insight into conditions such as generalized anxiety disorder and post-traumatic stress disorder and we are now pursuing study of the human vMT for that reason." Future research is needed to increase understanding of ways in which the vMT circuit affects behavior and how to develop treatments that can target specific parts of this system.